Axiom GB has completed an automated packing line solution for JD Williams, the UK’s largest independent home shopping retailer, at its Lilac & Briar Mill facility in Shaw, Lancashire. The new system has allowed JD Williams to increase its throughput of single item orders by 20 percent over its original manual packing operation. The fully automated system enables specific marketing literature to be married up with each relevant order, advice notes to be printed on demand and all the items to be bagged, labelled and dropped into dispatch cages. “We process around 150,000 items per day,” explains John Wilson, Head of Operations at JD Williams. He continues, “Roughly ten percent of all our orders are single items and prior to this new solution from Axiom, it was a labour intensive operation to pack and dispatch these orders. 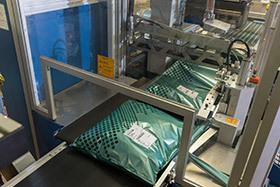 Once the single item orders have been picked and a barcode label attached, they are delivered to the start of the automated packaging line in cages. Here the operative places each item onto the top conveyor belt of the twin-level system. Each order is automatically scanned to identify it and determine whether or not any specific marketing literature needs to be provided for that item. If so, the correct piece of literature is automatically dispensed (from one of five dispensers) onto the lower conveyor beneath the relevant item. The next stage allows for the printing on demand of the advice note for each particular order. This is fed either directly onto the lower conveyor beneath the order item or on top of the marketing literature on the lower conveyor, if that has been provided for the order. After the advice note has been printed and fed onto the lower conveyor, the two conveyors merge via a decline on the top conveyor which allows the correct order item to be placed on top of the relevant paperwork. 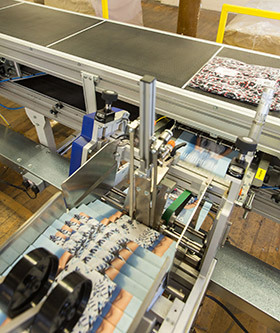 The now complete order continues by conveyor into the automated bagging machine which encases each order in a heavy-duty poly mailing bag, affixes a label and seals the bag. As it exits the bagging machine it is subject to a final scan with any discrepancies diverted to an inspection area. The cleared packed orders continue along the conveyor and are dropped into a dispatch cage which when full is taken to the dispatch area and allocated to a carrier. John Wilson again, “As you would expect, we went through a thorough tendering process to find the right partner to work with on this project. From day one, Axiom impressed us with their attention to detail and willingness to learn all about our single item order process before they started work on a solution. “We awarded them the business based on the overall strength of their solution, their ability to listen to our needs and the competitive price for the project. We’re constantly looking to improve our business, to get our products out the door faster, more accurately and cheaper. Consequently, we liked the totally automated aspect of the solution Axiom put forward. “Naturally, on a complex project like this, there were challenges that arose during the design and build process. For example, in the early days we weren’t getting the throughput we expected, but Axiom identified a solution and achieved that for us. “The ongoing support that we get from Axiom is very good. We have all the contact details for the directors at Axiom and they are always available to make sure our questions are answered quickly and effectively. “If there is an issue, they can remote into our system and there is also a camera on site so they can see what’s happening on the line. Most of the time they will sort matters out over the phone with our engineering team; otherwise, they will come on site and fix issues quickly. “From my point of view, they make my life easier. If there’s an issue they respond quickly, work out a solution and implement it. That’s reassuring for me; they know what they’re doing and we know we’ll get a solution that will get us back up and running fast. “After 12 months of having the benefits of the system Axiom designed and installed, it has made a significant and positive impact on our business. It is delivering exactly what we had anticipated; we wanted the maximum number of items going out every hour and we have achieved that thanks to the support of Axiom. Over the months the improvements in efficiency have just got better and better. In fact, we’re so pleased with the solution that we’re already talking to Axiom about designing a similar project in the near future,” concludes Wilson.